It was in the middle of January when Chris and Cynthia started talking about a visit to their home in Austin Texas. To my surprise one day while in a meeting, I received a calendar invite from Chris. Her meeting invite was for a flight to Austin on a Friday mid March (spring weekend). When I saw the invite I had to chuckle as I guess my girl took it upon herself (along with Cynthia) to pick a weekend and book our flights. It was about a week out from the Austin trip when we decided to call Cynthia to close out any open questions. Cynthia had Friday nights meal planned out and we would be eating in along with other friends. Since Friday was a light shrimp meal Cynthia wanted to drink whites so I figured Saturday would be a red night. That Friday morning finally arrived. After our workout we promptly cleaned up and started packing. Chris had teased earlier, wondering if she should go into the cellar and grab a bottle of Insignia. I smiled and explained to her that I had already planed to bring along an Insignia. The suitcase was mostly packed so I wandered down to the cellar. 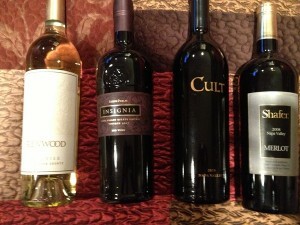 After a bit of thinking and bottle pulling, I came up with the following wines; Renwood Viognier, 2010 Beau Vigne Cult, 2008 Shafer Merlot and the 2007 Joseph Phelps Insignia. I think that will work? I laid the bottles on the bed and sent Cynthia a picture. Within the text I asked if she was “thirsty”? The bottles were packed inside the bag and we were on our way to the airport. We checked in with no issues and were loaded onto the plane. After a short and uneventful flight, we landed and I was glad to exit the small jet, which was basically a sardine can with wings…. We enjoyed Friday night with Cynthia, Dan and a few other friends. The white wine paired well with our meal. Saturday Cynthia had some Pampered Chef business to tend to, so Chris joined her. Dan wanted to take me to a southern BBQ for lunch and had a couple ideas. 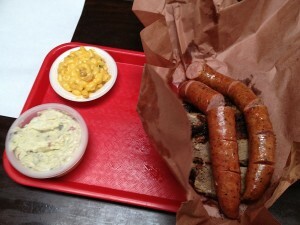 Once the ladies left we headed to Llano Texas to a BBQ called Coopers BBQ. The drive was about an hour and a half and I was thinking this must be really good if Dan is willing to drive that far! We finally made it and I have to agree the BBQ was excellent and worth the trip. One item that grabbed my eye was the home made Mac N cheese with Jalapeno and Bacon bits. It was mighty tasty. 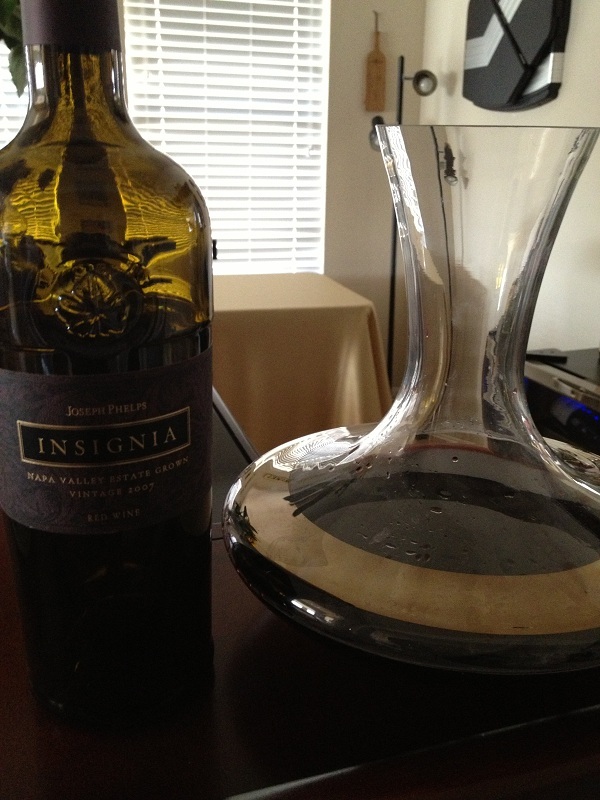 Early that morning, I decided to pull the cork on the 2007 Insignia. This wine is excellent and pulling the cork should only enhance it. When we got back from Llano it was time to pour the Insignia in the decanter. The girls would be home in about an hour and a half and I wanted the wine to be perfect. They arrived about 6:00pm and I had already poured the Insignia into everyone’s glass’s and we were ready to give it a try! 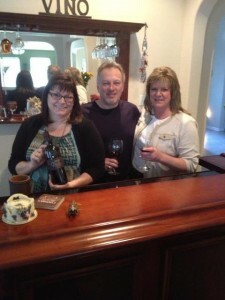 Everyone shared a “cheers” salute and tasted the wine. All I could hear were “hummmms” from the ladies who thought the wine was really good! After my initial taste I grabbed one of my tasting sheets. I never leave town with out a couple for notes! 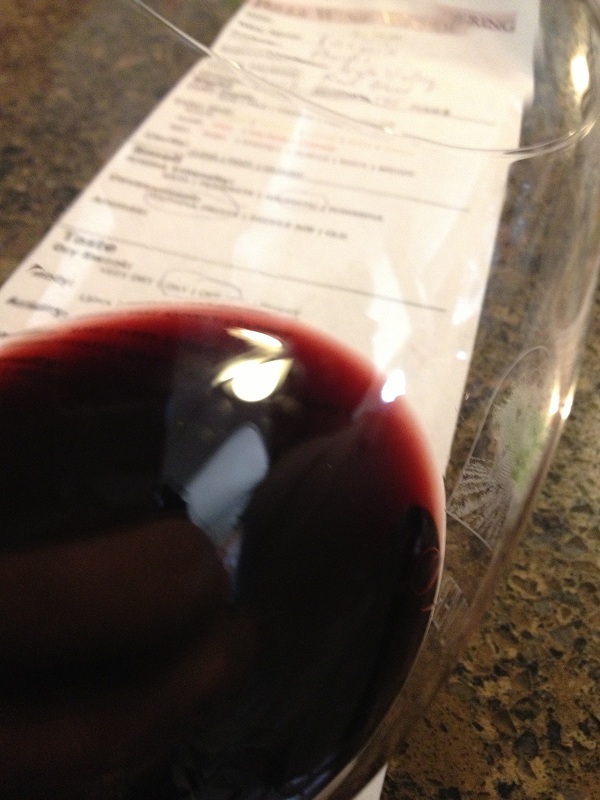 The color depth was deep with a dark garnet hue and the wine was clear in our glasses. The Insignia was very aromatic and young. We noted dark fruit, spice, dark chocolate. The initial taste was wonderful! The Insignia was just a tinge dry, but it was full bodied and the acidity was good. My mouth watered with every sip. The tannins were well structured and we could taste cocoa, dark chocolate, dark red fruit. Every sip was velvety with a soft long finish. I have many more bottles in my cooler. I guess Cynthia will have to come to Minnesota to try another year. I rated the 2007 Joseph Phelps Insignia four glasses. The girls wanted a picture to post on Facebook. It did not take us long to finish the bottle. We enjoyed a beautiful dinner Saturday night at Flemings in Austin with Cynthia and Dan. Darryl Wittle, one of the operating partners stopped by our table and Dan gave him a gift of chocolates from his recent travels. The wine, friends and overall meal was an excellent experience! After dinner we were back home and played a few games of “Farkle” dice. The following day we ventured out and tried a few Texas wines. 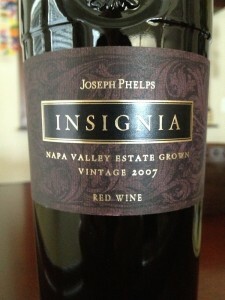 The first winery was pretty darn good but none will ever compare to a Phelps Insignia! 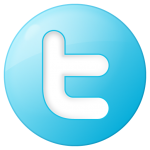 Nice blog and the pictures.